The A Song of Ice and Fire series by George R.R. Martin is one of the great fantasy stories of the past several decades. When it came time to translate it to the tabletop, CMON gave the task to two of their most accomplished designers: Eric M. Lang and Michael Shinall. Lang and Shinall are no strangers to creating epic games steeped in theme. Between them, they have created recent hits like Blood Rage, Rum and Bones, Rising Sun, and XenoShyft. 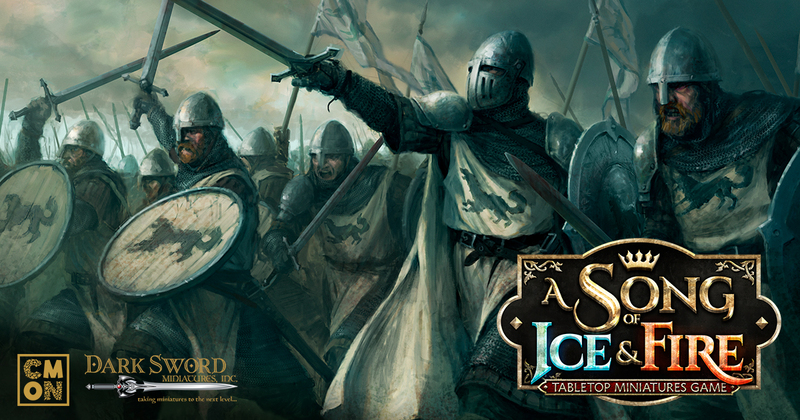 However, even with all that experience under their belt, A Song of Ice and Fire: Tabletop Miniatures Game (ASOIF:TMG) presented its own set of unique challenges. With an existing fan base and an established mythos in the series, the designers had to flex their creative muscles while staying true to the source material. Luckily, they were both appreciators of the books, themselves. “I was a fan of this series since A Game of Thrones was the only novel. I actually bought it at my local bookstore based on the title alone without even realizing it was by the same author as Fevre Dream,” said Lang. Shinall had read the first book in the series, but as soon as ASOIF:TMG was announced, he began devouring the rest. Whenever working with a pre-existing brand, there is fine balance between creating a game with exciting mechanics and player interaction, and doing justice to the source material. Shinall wanted to ensure that no matter what was added or taken away from the game, it retained the heart of Martin’s seminal work. Great effort was taken to ensure each of the units in the game worked functionally and captured the same essence as they did in the book series. “Every unit should not only have a specific purpose, but also a feel to them. ‘How do these guys contribute to the fight?’ is always the first question. Are they just rampaging murder machines? Are they tacticians? Do they inspire terror and panic in the enemy? You start to get a feel for the unit and then derive its mechanics from there,” said Shinall. Aside from getting the theme and flavor just right, Lang and Shinall wanted to create a tabletop miniatures game that would appeal to seasoned veterans, but remain accessible to people new to the hobby. “The depth is in timing; measuring your resources (non-activated units, open spaces on the tactics board, your cards) against opportunity,” added Lang. Teaming up on a project can sometimes lead to conceptual differences or butting heads, but Lang and Shinall found working together fostered their creative energies. “We have a very good dynamic. We both can approach the design from different angles with the same goal in mind. This diversity is key in a game of this scope and scale.,” said Shinall. He had started the design and had been working on it before Lang joined the project to add his expertise to the process. “I had the pleasure of working with a true miniatures game veteran immersed in his craft. The game was already good; I worked with Michael to help make it great. I enjoyed how often we came to the same conclusions about a problem and subsequent solution,” said Lang. With the Kickstarter for ASOIF:TMG launching in July 2017, fans can expect to see many different elements of the book series take physical form. It is a writer’s job to create a story on paper. Designers bring those stories to life on the tabletop. Follow updates on the ASOIF:TMG Facebook page here. Read the ASOIF:TMG Introduction here. Read ASOIF:TMG The Beginning here.